SHADE, ABSALOM, businessman and politician; b. c. 1793 in Wyoming County, Pa, reputed to be the youngest son of a farmer; d. 15 March 1862 at Galt (first called Shade’s Mills, now part of Cambridge), Canada West. He married first, Mrs Andrews of Canandaigua, N.Y., and secondly, Isabella Davidson of Galt; there were no children by either marriage. Absalom Shade trained as a carpenter in his youth and followed that trade in Buffalo, N.Y., until 1816. In that year he submitted a tender for the contract to build a court house and jail at Niagara-on-the-Lake, Upper Canada. 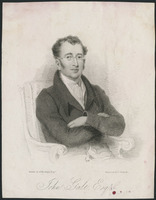 Although Shade’s tender was rejected, the young man so impressed William Dickson*, a member of the Legislative Council, that he hired Shade to manage and superintend the settlement of his lands in Dumfries Township, Gore District. In July 1816 Shade and Dickson journeyed to Dumfries to examine the lands, and after an extensive survey chose the site of what became Galt as the nucleus of the projected settlement. Shade went to Buffalo to arrange his affairs, and returned that autumn with his wife and two stepchildren to take up permanent residence on the site. By winter Shade had repaired and completed for himself a combined saw and grist mill which had been abandoned by an earlier settler, and built a two-storey log house which served as both a dwelling and a shop. Tradition has it that when Shade arrived in Dumfries Township he possessed only $100 and a chest of carpenter’s tools. He soon amassed a large fortune. The key to his success was the monopoly he enjoyed over a wide spectrum of business activities. Cash was scarce, and with Dickson’s financial backing Shade built up a large credit business at his store, where he charged a mark-up of 50 to 100 per cent on credit sales. When Dickson built the “Dumfries Mill” in 1818, Shade became its manager, ensuring a continuation of his control of milling. In 1820 Shade built a distillery adjacent to this mill and operated both businesses. Because of Dickson’s active campaigns to recruit settlers in Scotland and the United States, Shade’s Mills expanded and prospered in spite of its distance from a good market for grain and the area’s bad roads. As the population grew Shade’s many businesses flourished. In 1824 he erected a large general store and grain handling depot on the banks of the Grand River. In 1827 when a post office was established at Shade’s Mills, the village was renamed Galt. Shade became the postmaster and retained that position for 25 years. In 1827 Shade bid for and received several large contracts to supply lumber, flour, pork, and other provisions to John Galt* and the Canada Company, then engaged in building roads through the Huron Tract. So profitable were these contracts that within a year Shade was able to purchase the Dumfries Mill from Dickson. As part of the transaction Shade received a guarantee that Dickson would not sell land to any other miller, distiller, merchant, or grain dealer who might compete with Shade. In 1832, Shade built a second store across the street from the first. At the original “Red Store” Shade conducted his credit business, while at the new “White Store” he dealt at somewhat lower prices for cash. His monopoly of Galt’s mercantile trade secure, Shade now turned over the management of his many enterprises to James Fargis, his nephew, and James K. Andrews, his stepson. He then devoted his energies to public office, the promotion of transportation projects, and the management of numerous farming properties and a large mortgage and money-lending business. Shade’s many mercantile enterprises and his land dealings gave him a life-long interest in the improvement of transportation. In 1819, for example, he had initiated a subscription campaign to build a bridge across the Grand River at Shade’s Mills. When subscriptions fell short, he underwrote much of the cost himself. In the early 1830s Shade undertook the daring experiment of building several large (18 x 16 ft) flat-bottom barges on the Grand River. In the spring, even though the high water was dangerous, he loaded the barges with barrels of flour, grain, pork, and other produce intended for export, and floated them down the Grand to Dunnville. The barges were then towed by horses via the Wetland Canal to Port Dalhousie (St Catharines) where both the produce and the raft-timber were sold. As a natural outgrowth of this endeavour, Shade became an active promoter and one of the original incorporators of the Grand River Navigation Company, which was chartered in 1832 to improve navigation on the river, there being no good road from Galt to Dundas. As Shade’s fortunes grew and his business interests broadened, he became associated with the Hamilton business community in the founding of the Gore Bank in 1835. In 1852, in company with his Hamilton associates, he became an incorporator and shareholder in the Galt and Guelph Railway. He was also an active promoter of both the Preston and Berlin Railway and the Berlin and Stratford Gravel Road Company. Always a strong Tory in politics, Shade served two terms in the House of Assembly. 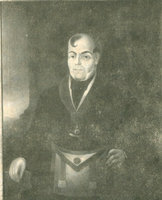 In 1831 one of the two sitting members for Halton County, James Crooks*, was elevated to the Legislative Council. Shade was elected to the assembly in Crooks’ place and served out the term. In the election of 1834 Shade and his running mate, William Chisholm*, were defeated by James Durand and Caleb Hopkins*, but in the violent election of 1836 Shade and Chisholm were returned. Shade served without particular distinction until 1841 when he retired. Although he was frequently mentioned as a possible Tory candidate, he henceforth refused nomination. During the rebellion of 1837 he acted on the local commission of the peace to examine suspected rebels, and helped organize a detachment of militia for service on the Niagara frontier. On the local political scene Shade held almost every nominated and elected municipal office over a 30-year period. After local government was organized in Dumfries Township in 1819, Shade frequently served as chairman of the township meetings, as well as holding such offices as pound keeper and assessor. In 1828 he was named a magistrate for Gore District and ably represented Dumfries’ interests at the Gore District quarter sessions. When elective municipal government was established in 1841, Shade was elected a township councillor, and in 1852 was elected as the second reeve of the newly incorporated village of Galt. In 1852 Shade retired from public life and devoted his time to managing his estate and numerous local charities. He died in 1862 after a short illness. Cambridge Public Library (Galt, Ont. ), Miscellaneous historical papers. PAC, MG 24, D16, Shade to Isaac Buchanan, 18 July 1854, 20 Feb. 1856; E1, Shade to Merritt, 14 March 1833, 25 July 1845, 17 March 1849; RG 1, L1, 18–39. PAO, Dickson (William) papers. Correspondent and Advocate (Toronto), 1836. Dumfries Reformer and Western Counties Agricultural and Commercial Advertiser (Galt), 19 March 1862. Galt Reporter and Waterloo County Advertiser, 21 March 1862, 1870–71. B. M. Dunham, Grand River (Toronto, 1945). R. S. Hamilton, The early history of Galt, 1816–1866, ed. A. W. Osborne and A. W. Taylor (Galt, Ont., 1956). Leo A. Johnson, “SHADE, ABSALOM,” in Dictionary of Canadian Biography, vol. 9, University of Toronto/Université Laval, 2003–, accessed April 24, 2019, http://www.biographi.ca/en/bio/shade_absalom_9E.html.